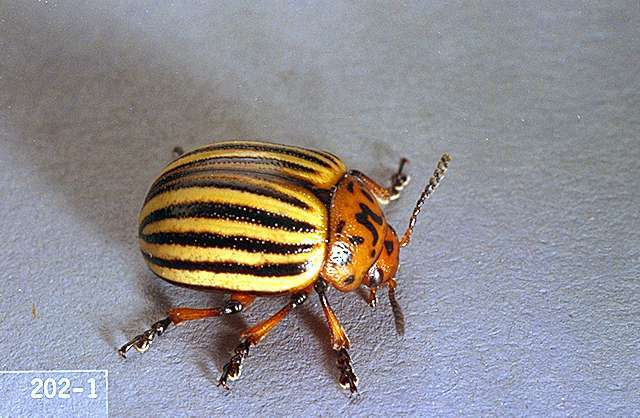 Pest description and crop damage The Colorado potato beetle (CPB) is a yellow and black striped beetle, about 0.5 inch long and 0.25 inch wide. 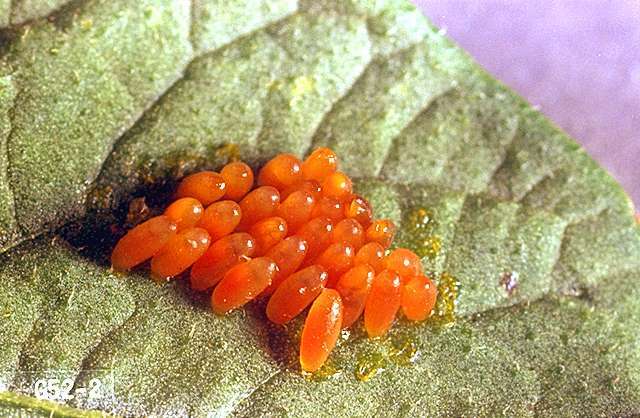 Larvae are reddish orange, with two rows of black spots on each side. Yellow egg clusters are found on leaves. Adult and larvae can cause complete defoliation and nearly complete crop loss if allowed to reproduce unchecked. Larvae are more voracious than adults, feeding up to 40 sq cm of leaves or green tissue. Biology and life history Both larvae and adults feed on potato foliage through the season. Pupation occurs in the soil. Adults overwinter in the soil, emerging to feed, lay eggs, and mate in the spring. In cool climates, the beetle undergoes only one generation per season, but in warmer areas, such as the southern Columbia Basin, it may have up to three generations. Other host plants of CPB include solanaceous weeds such as nightshade, and crops such as tomato and eggplant. CPB are sometimes found on puncture vine, though it is not known if they are obtaining nutrients. Scouting and thresholds Check fields for CPB starting at crop emergence: beetles are easily spotted when plants are small. Because larvae feed toward the tops of the plants, scouting for this insect is easily done as workers walk through fields. There are no established treatment thresholds for CPB. The goal of management should be to limit population growth and spread through fields and farms: large populations are harder to manage than small ones. Usually, damage starts around the border of the fields since adults tend to walk rather than fly. CPB can completely defoliate potato plants if left uncontrolled. This insect is unpalatable to some generalist predators, but eggs and young larvae are fed upon by Geocoris big-eyed bugs and Nabis damsel bugs. There are also two large predatory stink bug species that feed on CPB larvae and at least one species of beneficial fly of the genus Myiopharus (previously known as Doryphorophaga) that attacks CPB. Birds such as crows are also good predators of CPB. In some situations, severe disease-related mortality can occur during pupation and overwintering in the soil. Crop rotation is very important for CPB management. 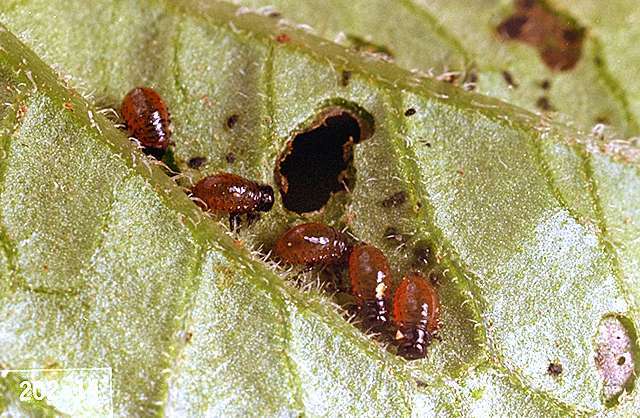 Adults overwinter in the soil, so if potatoes follow potatoes, beetles will emerge and immediately infest the new crop. Some studies suggest at least 0.5 km distance between fields to provide protection when crops are rotated. Trenches are also recommended since the beetles disperse from their overwintering sites by walking. kaolin-Applied as a spray to foliage it acts to repel certain insect pests. Some formulations are OMRI-listed for organic use. pyrethrins (often as a mix with other ingredients) -Some formulations are OMRI-listed for organic use. spinosad- Some formulations are OMRI-listed for organic use. CPB can develop high levels of resistance to almost all classes of chemicals. Carefully rotating chemical modes of action is critical to slow the development of insecticide resistance. Insecticides listed in Tables 1-3 are classified into groups by their modes of action. In many parts of the PNW, chemical control of CPB is necessary to avoid catastrophic build-up of populations. A standard practice is the use of neonicotinoids at planting. Generally, insecticides should not be applied until egg hatch begins. Border sprays are sometimes an economical choice, especially early in the season before populations build up.